The main benefit of having the Chinese Parent Cafes available to the Chinese communities is that they are culturally and linguistically relevant. Families and staff prefer this family engagement platform because it helps them to overcome cultural and language barriers immigrant families often experience during their acculturation process. “I think the cafe will impact the lives of the Chinese parents and children, because the café agenda is very different from most of the general support group, ” Christy Li, Joy Lok FRC Family Support Coordinator states. The Chinese Parent Cafes agenda and materials are meeting the needs of the Chinese families, through connecting with their own peers to learn with each other, the families engage in the Zuoren, continuously learning and self-cultivating. 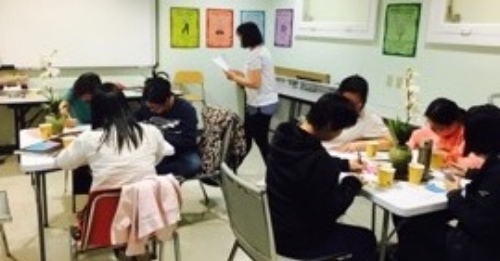 The families are able to apply what they learn in the Chinese Parent Cafes to support other families that they will meet in their immigration and child rearing journey in the United States. At the same time, the family advocates and program staff working with the families become more skilled to tailor the Chinese Parent Cafés to meet the Chinese families’ aspirations to be confident leaders in their own family unit and community. As a result of the 35 cafes at Kai Ming Head Start, family advocates were able to provide additional community resources to the participants in areas of appropriate discipline, child development, emotional needs of children, financial services resources, immigration resources, labor law, legal services resources, positive approaches on parenting and workshops on American and Chinese education systems.